Select an aircraft image below to pre-purchase an air-ride. *Purchase an air-ride in advance and you will receive a FREE ground tour wrist band at the gate. **General Admission can be purchased online now using the red TICKETS button above or at the main gate the day of the event (Credit Card online. CASH ONLY at the gate - ATM available inside JVL terminal). ***Family Ticket defined as: Father, mother, and immediate children under 18 years of age. Autographed copies of author Steve Snyder's, "SHOT DOWN" - The true story of pilot Howard Snyder and the crew of the B-17 Susan Ruth. Snyder’s masterful book puts the reader inside the cockpit, shoulder to shoulder with the pilot and crew. Accessible and relevant both to historians and readers with a casual interest in WWII history, "Shot Down" is a must-read for anyone with an interest in this gripping period of American history. M37 Dodge ​3⁄4-ton 4x4 military truck and 5-ton WWII military wrecker. Janesville's newest flight school and aircraft rental. Discovery Flights available. Six simulations to choose from! Learn all about this cool sport and view hang gliders up close. Members presents to answer your questions. Private Event for Media & Select Veterans. Get your tickets today! Only $10/individual $25/Family (Select Ticket link at top of page). All aircraft participating in air rides (Weather permitting). $8 single rider, or $15 double rider. Six simulations to choose from. Tour the helicopter & meet the crew. Enroute to EAA AirVenture - Mass Fly-Over. Autographs and photo opportunities by warbirds. Swing & Wings 2019 - A 1940's Hangar Party - Open to the public! Enroute to EAA AirVenture 2019 in Oshkosh, Wis. Parking is FREE. Park at the main terminal, former Blackhawk Technical College lot, Helicopter Specialties lot, Northern 1/2 of Glen Erin Golf Course lot, or grass lot next to Janesville Jet Center (Shuttle Service Provided). Marshallers will direct cars to those parking areas. Handicap parking, drop-off, & pick-up is available at the front of main terminal building. No large bags, backpacks, coolers, or pets. No food or drinks allowed through the gate. No weapons of any kind to include guns or knives due to being a TSA controlled venue. All personal items are subject to search. Acceptable items: Bagged or folding chairs, camera gear, strollers, wheelchairs, personal medical devices (although subject to search). No smoking in terminal or while on the tarmac viewing aircraft. ATM machine available in the Janesville terminal if cash needed. Ground Support and Safety provided by the United States Submarine Veterans, Inc. (USSVI), Janesville VFW Post 1621, CAF volunteers, and Janesville Jet Center. Event security detail provided by Southern Wisconsin Auxiliary Force (SWAF). This event would not be possible without the generous volunteer work from these organizations. To honor the men & women who built these warbirds and honor the veterans who faught to defend and secure our freedom. To educate current and future generations of the importance of our aviation heritage. Interested in becoming an event volunteer? Join the Commemorative Air Force as a CAF Supporting Member, CAF Colonel, or higher and feel the honor of supporting a fantastic local annual event! If these planes could talk, what would they say? And would we listen? The CAF is committed to helping these planes talk to people all over the country who listen to them tell their stories of service and sacrifice. Hear them for yourself by visiting the Airpower History Tour in Janesville, Wisconsin. Coming to Janesville Warbird Weekend 2019! As part of the Commemorative Air Force (CAF) Central Texas Wing, That’s All, Brother is collaborating with 15 other C-47/DC-3 airplanes to make the epic journey back over the Atlantic in 2019. We will be retracing the classic ferry path from the United States to Canada, Greenland, Iceland, Scotland, and England to join up with over 30 C-47/DC-3 airplanes in Duxford, England as part of the Daks over Normandy project. From there, we will travel to Normandy for the 75th anniversary, then to Germany to commemorate the 70th anniversary of the Berlin Airlift. Fly-ins to Janesville (KJVL), aircraft parking will be hosted at Janesville Jet Center FBO. Purchase at least 20 gallons of 100LL or JET-A, the Pilot In Command and passengers will receive FREE general admission wristbands for Janesville Warbird Weekend inside the FBO. Walk to the Janesville Terminal (main gate) and show your wristband. Please DO NOT walk across the tarmac to the event as this is an FAA controlled area. Janesville has some of the lowest fuel prices in the area if you are planning a trek northward to EAA Oshkosh '19. Have a warbird you would like to display on the warbird flight line? Contact the event coordinator using contact button at bottom of page to make arrangements. ATM available inside main terminal / gate - an ATM fee may apply. * If all or any portion of the event is canceled due to inclement weather or for any reason beyond the control of the CAF, no refunds will be given for ground tour tickets purchases. The schedule and aircraft participating is subject to change at moments notice. No refunds will be given due to the failure of any acts or aircraft to appear or participate. Refunds for air-rides will be issued per CAF policies due to any cancellation. Please use the "Contact The Organizer" link at the bottom right corner of this page. Individual Ground Tour Pass - Saturday Janesville Warbird Weekend 2019, brought to you by ABC Supply Co. Inc. www.abcsupply.com Southern Wisconsin Regional Airport Ticket is valid for 1 day of admission, 8am to 6pm daily. Bring ticket purchase confirmation to gate and exchange for wristband. Family Ground Tour Pass - Saturday Janesville Warbird Weekend 2019, brought to you by ABC Supply Co. Inc. www.abcsupply.com Southern Wisconsin Regional Airport Ticket is valid for 2 days of admission, 8am to 6pm daily. Family defined as: Father, Mother, and immediate children under 18 years of age. Bring ticket purchase confirmation to gate and exchange for wristbands. Individual Ground Tour Pass - Sunday Janesville Warbird Weekend 2019, brought to you by ABC Supply Co. Inc. www.abcsupply.com Southern Wisconsin Regional Airport Ticket is valid for 1 day of admission, 8am to 6pm daily. Bring ticket purchase confirmation to gate and exchange for wristband. 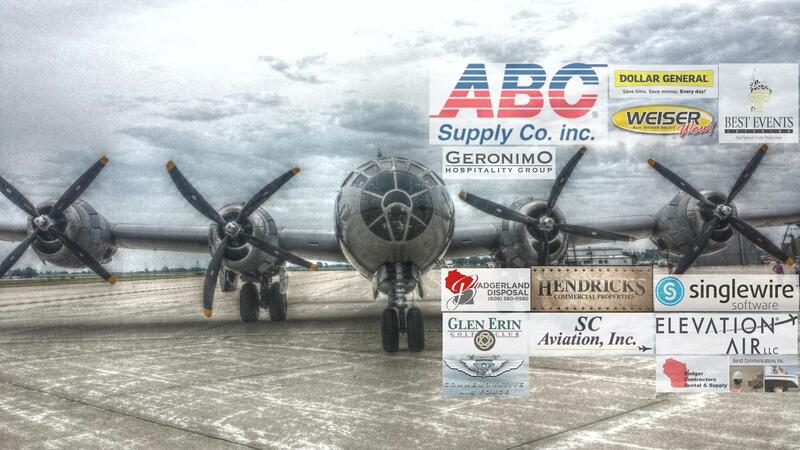 Family Ground Tour Pass - Sunday Janesville Warbird Weekend 2019, brought to you by ABC Supply Co. Inc. www.abcsupply.com Southern Wisconsin Regional Airport Ticket is valid for 1 day of admission, 8am to 6pm daily. Family defined as: Father, Mother, and immediate children under 18 years of age. Bring ticket purchase confirmation to gate and exchange for wristbands.